Newtown Mission Community Care Centre is where people from all walks of life can come & relax, meet with people, make friends, seek help and support or a meal. They work hard to establishing a community based on Christian principles – loving God first and loving people. Newtown Mission provides approximately 100 meals each day thanks to the generosity of the community who give in kind or cash, as well as food parcels to those in need. 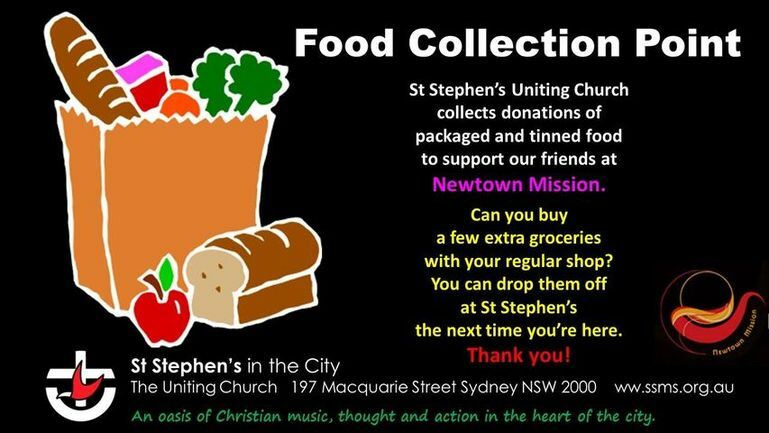 St Stephen's supports Newtown Mission by being a food collection point. Can you buy a few extra groceries with your regular shop? You can drop them off to St Stephen's the next time you are here.